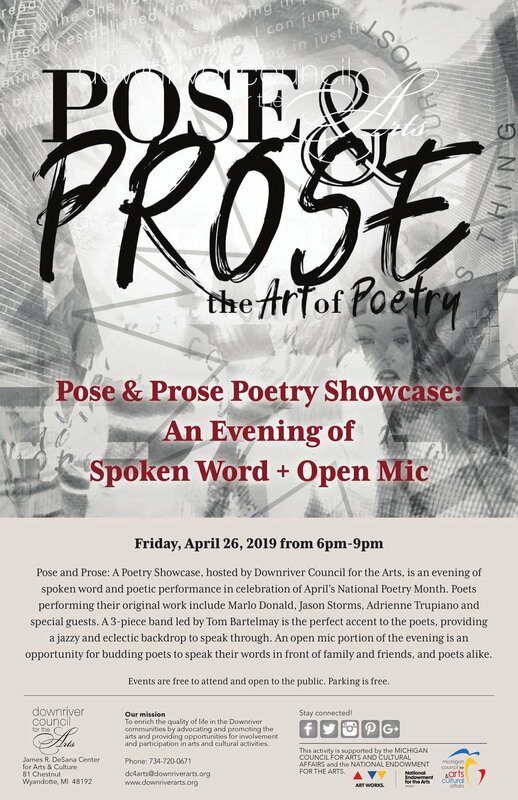 Pose and Prose: A Poetry Showcase, hosted by Downriver Council for the Arts, is an evening of spoken word and poetic performance in celebration of April's National Poetry Month. Poets performing their original work include Marlo Donald, Jason Storms, Adrienne Trupiano and special guests. A 3-piece band led by Tom Bartelmay is the perfect accent to the poets, providing a jazzy and eclectic backdrop to speak through. An open mic portion of the evening is an opportunity for budding poets to speak their words in front of family and friends, and poets alike.